There’s nothing like a good road trip book. You get to live vicariously through people on an epic adventure, and the journey is often so much more than just a physical one. While I wasn’t a huge fan of Barnholdt’s Two-Way Street, I’m always up for a road trip book, and I was curious to read Right of Way. A lot of the issues I had with Two-Way Street were the same in Right of Way. The characters were immature, dramatic, and overreacted to everything. And yet, even though I found myself shaking my head and rolling my eyes at their theatrics, there was a part of me that felt like their reactions were authentic. They were teenagers, after all. And it’s not that Peyton or Jace were unlikable - they both had distinct personalities, and there were moments when I felt myself warming up to them, I just never got to the point where I loved them, or even connected with or related to them. Something else that rankled a bit was all the swearing. Swearing in general doesn’t bother me, but there was a lot of it in Right of Way, and at times it felt forced - as if the author thought ‘this is what teenage boys should do’ and while it may be true, it felt like a bit much at times and I think it would really turn some people off. I liked the dual POV and how it went back and forth not only between Peyton and Jace, but also between the past and present. I thought at first that it might get confusing, but I didn’t have any trouble keeping up with it. Kudos to Barnholdt there, because dual POV can be tricky, plus throw in the different time frames and it could be a disaster. I thought it was a nice break from traditional ‘flashback’ scenes that happen in the present, which can sometimes really bog down the story and get confusing. It was interesting to see the events that led up to the present and why Jace and Peyton acted - and reacted - the way they did - even though, again, a lot of it was overly dramatic and I often wondered what the big deal was with certain things. They made it seem like horrible, life-altering stuff, and while some of it, particularly what happened to Peyton, was pretty crappy, it just seemed like a lot of build-up and drama for something that she could have fixed if she’d wanted to, instead of just running away (which was her response to pretty much everything). The story felt like it was lacking a bit. There wasn’t much to the actual plot, and there wasn’t much character growth. The characters were developed well, and I felt like I got a sense of who they were, but they didn’t really learn much, or grow. Normally in road trip books, you get the sense that the journey is as much an emotional one as it is physical. Characters leave home to get away from their problems, and they learn a lot about themselves, their issues, and life in general along the way. I didn’t get that sense in Right of Way, and I was kind of disappointed. With all that being said, I didn’t dislike Right of Way, I just thought it had issues. It was cute and funny and mostly realistic. I enjoyed the glimpses of life on the road from both Peyton’s and Jace’s perspectives. If you’re in the mood for a light read, or love road trip books, I’d recommend giving Right of Way a try. *Note: If you haven’t read Two-Way Street, Right of Way is technically a standalone companion, but there are a few spoilers for the first book. They’re kind of obvious ones since it is a romance, so if you don’t mind that, you can read Right of Way without reading Two-Way Street. Have you read Right of Way? How about Two-Way Street? Do you love road trip books as much as I do? That's too bad this one didn't stand out more. 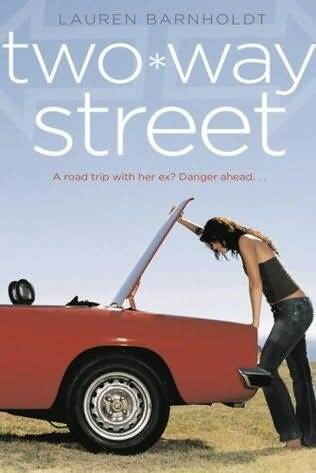 I've read Two-Way Street and felt the same way about it ... it was cute, but not very memorable, unfortunately. I guess I want more substance in my YA romance!